One of the best things about having a cooking blog is that people often text me or email me with a new recipe. Maybe it's something tried and true, or maybe it's something new. Either way, it's always exciting to hear that someone was so thrilled and pleased with a dish that he or she felt the need to share it! Isn't that awesome? Seriously, let's think about that for a second. Someone has just cooked something and thought "OMG this is SO good I need to tell someone about it!" Isn't that fun? And I'm happy to provide a platform with which to do just that! This recipe come from my niece, Katie. She found it on a blog called Home Cooking Memories, and texted it to me a couple months ago. I figured now would be the perfect time to share it. It's the perfect summer recipe that you can quickly throw together in no time and have a lovely dinner for two out on the deck with a nice glass of wine. Doesn't that sound like heaven? It's easy enough for the novice cook, and sophisticated enough to be impressive on a first date. Perfect! Thanx Kate!! So keep those recipes coming! And if you happen to think of it, take a picture and send it to me with the recipe! I'd love to share it! In a large frying pan, heat 2 tablespoons olive oil over medium-high heat. Add shrimp to pan in a single layer and cook for about 3 minutes, turning them over to cook both sides. Season shrimp with 1/4 teaspoon salt. Shrimp should be beginning to pink on both sides and be opaque, but just slightly undercooked. Remove from frying pan and place shrimp on a plate. In same frying pan, heat another 2 tablespoons of oil over medium-high heat. Add asparagus and cook until asparagus is tender-crisp, bright green, and just barely beginning to brown. Season asparagus with 1/4 teaspoon salt (or more if needed). Add ginger and garlic and stir to combine with asparagus. Cook for another 30-45 seconds or so. Pour in lemon sauce mixture into frying pan with asparagus. 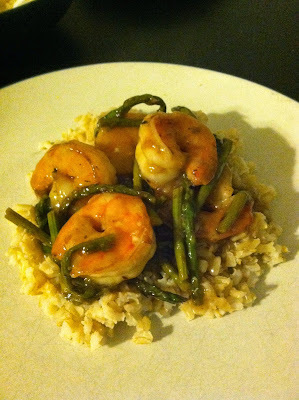 Add shrimp back into pan and combine sauce with asparagus and shrimp. Simmer for about a minute or until sauce is thickened. Remove from heat and serve over rice. Katie said this dish reminded her of Chinese take out garlic chicken. She added a little pinch of crushed red pepper flakes "because she's a pepper monkey", and also said perhaps she'll pump up the lemon a little more next time, but it was delicious just as is. If you'd like to swap out the asparagus for any other veggies, go for it! I'm sure this would also work perfectly with chicken instead of shrimp. I would cut boneless chicken into small pieces, dredge it in seasoned flour to lightly coat, then saute it in the pan until partially cooked, and finish cooking it with the sauce as directed with the shrimp. YUM!